DARK CANVAS the Novel new chapters every week! What is the most amazing coincidence you have ever had? I was once at a cattle call for extras on the movie “Rush” and I found myself sitting at a table with four other people named Jody…. We all had to get out our IDs before we believed it….. What’s yours? 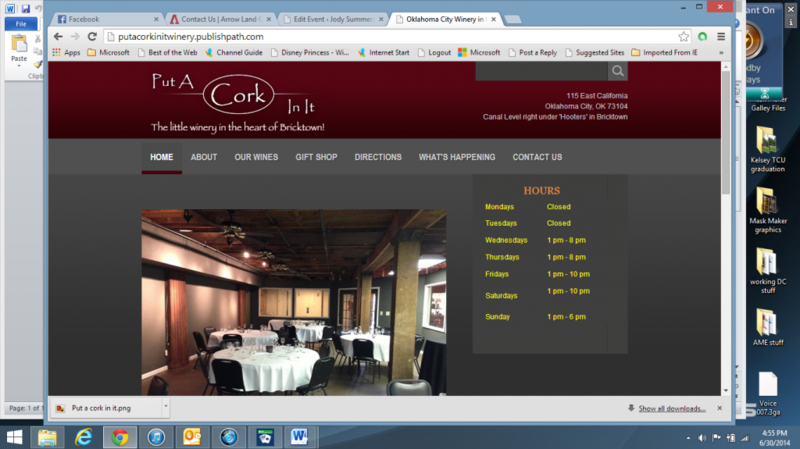 Come join me tonight at the Put a Cork in it Winery in Bricktown. Walk or boat on the canal, grab a taste or two of wine and get a signed copy of my books. The address is 115 E. California St. Oklahoma City. I’ll be there from 5-8pm. Come on down and say hi! Watch my blog for intermittent specials on my books. This weekend I’m running a Dark Canvas-Kindle give away for 3 days. Friday the 4th through Sunday the 6th you’ll be able to download Dark Canvas for FREE! Stay tuned to my blog for other specials….you never know when something will pop up!